In Police Quest 2, Jim Walls and Sonny Bonds make their respective returns, two years after Sierra’s release of the original. In this episode, Walls focuses on that eternal emblem of police the world over – the homicide detective. 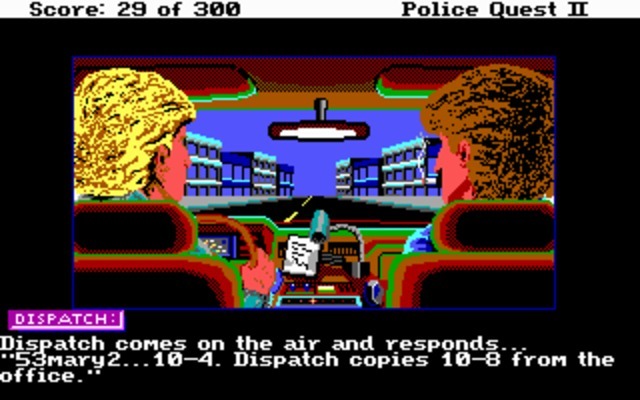 It’s the job that’s a goal for many, the most glamourized in the media, and here it gets the Police Quest treatment. You’ll be guiding Bonds through the familiar streets of Lytton, and a not-entirely-welcomed reunion of all the surviving cast from the first game. Playing the first game before this one is not a stone cold requirement, but is a very good idea to be able to follow along with the plot, as it references characters, events, and outcomes from the first pretty much all throughout the game. It'sa time for'a de reinforcin' a da stereotypes! PQ2 takes place one year after you’ve tracked down the Death Angel, and aside from the difference in job description, there’s not much change from the ending of the first game to the beginning of the second. Bonds’ hair is still dyed golden, he and Marie are still cultivating their relationship, and Jessie Bains is still in jail… but not for long. 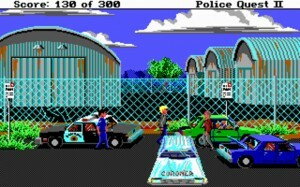 In what marks his second consecutive escape from county jail (Lytton apparently has no maximum security lockup), Bains overpowers a guard and flees, setting off the events of the second game. You will use all the tricks in your homicide kit to stay on his trail as he takes care of some unfinished business, and leaves a few warm corpses behind. A lot of improvements are made over the somewhat shaky original, not the least of which is the darker and more serious tone of this game. 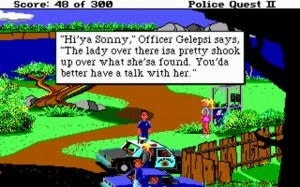 This should be expected since you’re now investigating murders instead of escorting kooky drunks to jail, but the entire game is far less childish than the first. The goofy humor has been reduced, Chief Whipplestick has been given the axe in favor of the much more plausible “Chief Eric Heitman,” and the plot has turned away from leaving chickens on the Sarge’s desk and ogling over Hootchie Kootchie Hannah. Fair credit must be given to Walls’ writing – he did indeed get better. Part of this could be because of gained experience or classes in the two years between, part could be that he saw a lot of triple-A cop films (and there were a lot by ’89), and got a better idea of how to mix drama, entertainment, and realism. Whatever the reason or combination of reasons, PQ2 is a better-written story. Despite some comedic, sarcastic, and racial scenes, it is also easier to take seriously. There’s a greater use of procedure here than you needed to know in traffic, but less of a reliance on it – meaning that fewer mistakes will result in instant death. Most mistakes of procedure will result in missing evidence, which results in fewer total points earned. What you don’t collect is presumably taken by a second team, but through a combination of artificial progress blocks, the most crucial pieces of plot-related evidence cannot be overlooked. If you stray too far from your path or ignore your current orders, you’ll get a browbeating from your Captain and a game over for repeat offenders. When you’re on-scene, you’re tied down by a chain-smoking partner. He’s completely useless for furthering your investigation, but finds ways to excuse himself for a smoke break, or to “check” a useless area, and will only reappear when you have found the plot point needed to move on. If you try to leave without him, you’ll get a “I can’t leave my partner” type message. Sorry Bonds, I don’t share that sense of loyalty. As far as the homicide-investigating goes, this was probably far more revolutionary and intriguing when it came out. The manual goes to fair lengths to detail proper steps for evidence collection, but they seem like a part of the social consciousness now. I haven’t even seen an entire episode of CSI, and I already knew to bag appropriate items, use plaster for shoeprints, and photograph the crime scene before you move things. Yet ultimately, the main fault of this game is that the clues are virtually useless – you’re collecting evidence in expected and familiar ways, and giving it to the booking officer, where you will never see it again. Rarely will it help point your investigation. For example, Bains nearly runs over you in a car. When you find the car in the next scene, you can find his prints inside – but you already know he was there. You can dust the car and tape some partials, but you don’t need them to find his whereabouts – you just saw him in that car, and the more pressing issue is that he’s ditched it in the airport parking lot and is now buying a ticket for Bermuda. The game also makes collecting evidence as easy as possible. The hard part is finding what you want to collect. This, of course, relies on being able to figure out exactly what the parser wants you to type. Otherwise, you don’t always need to know the tools and process needed to get the evidence. While you could type something like “open field kit,” “use collection swab on blood,” and “place swab in vial,” you can just type “get blood” and skip a few steps without penalty. Some will be almost offended by that level of foolproofing, and I’d have to agree with them. The text parser returns, though this time, the input line only appears once you start typing. The main benefit of this is to allow the entire screen to be used to set the scene, instead of the small window in the original. The parser is about on par with the first, and still a little flaky on dialogue responses, or when expecting you to type something other than the standard interaction commands. There’s also a differentiation between “look” and “search” which is important to know, and “look down” will be an absolute lifesaver as you move around and try to spot evidence. The game breaks out the area around your character even more explicitly than the original, so typing “look” while standing next to the Captain’s desk will give a different response than typing the same thing at your desk. This requires you to move around and work the scene to a greater degree, which is nice, but can really trip you up if you aren’t expecting such distinction. The game also gives significantly less help from the “look around” command than in the first, or other games of the time. Perhaps I’m still used to text-based adventures, so I expect the “look” command to highlight or clue me in to all of the items in the scene I can interact with. PQ2 usually doesn’t come close to this, instead relying on its graphics to “show” what you can work with. A good example is the inside of a car, where you must think of and try all the parts of a car interior – wheel, vents, floorboard, etc – you can possibly think of to find evidence. The “look” command won’t list these out for you. Fortunately, the graphics have been significantly improved to make this visual detection at least slightly possible. We’re still in EGA land, but with full artistic advantage of the SCI’s nearly doubled resolution taken and run with. Characters are a far cry from the lanky pixel-men of the original, and locations have far more detail and style. The colors and varieties used in every scene are impressive, considering there’s only sixteen colors at a time, and comes from a mastery of the hardware and of the art. The updated engine also allows for windowed close-ups of parts of the area being investigated, like an open drawer or a blood trail, and a few gawky, but serviceable, close-ups of talking faces. Driving makes a return from the original, but now in a non-interactive form. You will type the location or address of where you want to go, and sit through a brief sequence as your partner works the radio and puffs away from the passenger seat. You won’t have to struggle around an overhead map and dodge traffic anymore. It looks good graphically, and certainly removes a needlessly frustrating sequence from returning. Sound exists, but barely. The only effect I can recall is a short bleep from the speaker for a gunshot, and a little PC speaker theme played every time you gain points. There are also some brief, occasional background themes. They work to spice up tense moments or driving sequences, but are mostly forgettable. This was before the proliferation of sound cards, so don’t expect much. The crime scene work is interesting, and some clues are certainly hidden well. If you’re not familiar with police duties, the manual will list out helpful steps to suggest the maximum achievable points. You will also frequently get in-game clues if you use the right observation commands. Still, you’re not doing much detective work. Mostly you’re simply chasing Bains. Most of the time, you’ll already know what car he’s driving, who he’s killed, and who will be next. Thus, the work just goes into collecting evidence for a hypothetical trial, and finding the one subtlety-of-a-hammer clue pointing directly to his next location… sort of like a bloody version of “Where in the World is Carmen Sandiego?” If you’re not into earning all the points or doing the best job you can as a detective (of which the points are simply a measure of), then you’ll probably get frustrated by trying to find evidence that ultimately is only a side bonus. 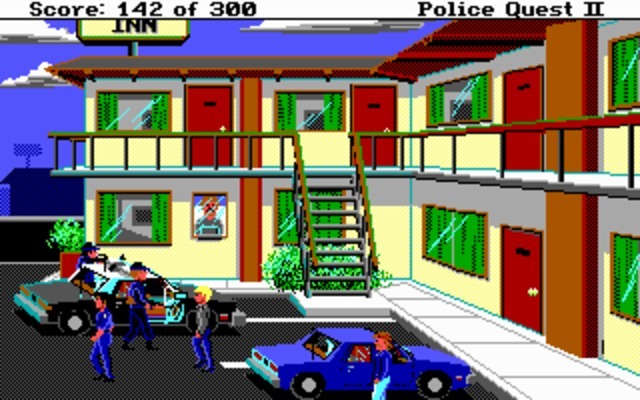 The game is a definite improvement over the writing and tone of the original, and is worth playing if you’re a Police Quest fan, or enjoy a modern detective story. It even has a couple nice additions, like testing and adjusting your pistol in the shooting range, to keep you from “missing” in the field. However, the entire game isn’t necessary from a story perspective. 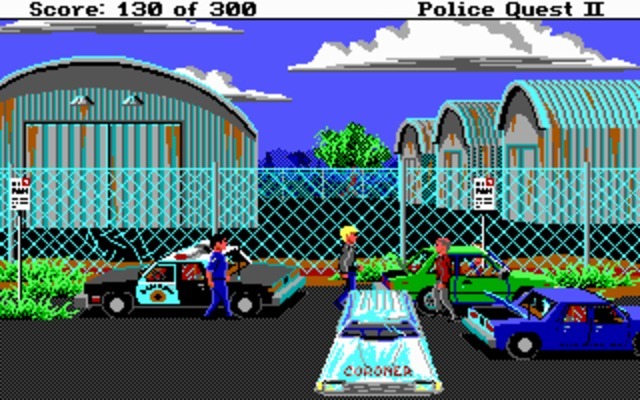 The actual “homicide investigation” isn’t much of an investigation at all, but I suppose “Police Quest 2: Sonny Works De Facto for the Department of Corrections and Collars Bains Again” wouldn’t sound as exciting. If you don’t want to deal with a parser interface, you can play the VGA remake of PQ1, and skip right to PQ3, without missing a single story element here. The story relies too much on forcefully continuing the wrapped-up plot of the first game, when Bains could simply have stayed in jail, and you could have been given a brand new homicide case with new characters. Then you would actually have some detective work to do to find an unknown, unpredictable killer, while adding to the story of the franchise. As it stands, this is like the epilogue that didn’t need to be made. If you’re interested in playing as a detective and collecting evidence, this game is a fun representation of that. If you’re expecting to solve a mystery too, look elsewhere. Improved graphics, writing, and dialogue. Playing as a homicide detective is interesting. Disappointingly predictable and unimaginative plot gives little purpose to your investigation.